QPR suffered their first defeat of the 2016/17 season on Wednesday night, losing 3-2 at Barnsley. In a game which swung one way and then the other, it was eventually the hosts who came out on top at Oakwell. Marley Watkins gave Barnsley the perfect start, heading home from close range in the fifth minute. Tjaronn Chery levelled from the spot straight after half-time, and then Rangers went 2-1 up when Seb Polter netted QPR’s second penalty of the night with just 16 minutes remaining. But on 77 minutes, Barnsley levelled through a Conor Hourihane free-kick and the Tykes sealed all three points with a Josh Scowen goal in the 89th minute. Jimmy Floyd Hasselbaink opted for the same line-up that featured for much of QPR’s 2-0 win at Cardiff City four days ago, meaning Yeni Ngbakoto replaced the injured Ben Gladwin to make his first league start for the R’s. Alex Smithies lined up between the posts behind a back four of, from left to right, Jake Bidwell, Steven Caulker, Grant Hall and Nedum Onuoha. Karl Henry and Massimo Luongo played ahead of the back four, with Jordan Cousins starting on the right and Ngbakoto on the left. The in-form Tjaronn Chery played behind German striker Seb Polter. The Tykes went into this fixture full of confidence after their 2-0 weekend win against Derby County here at Oakwell. Unsurprisingly, Paul Heckingbottom kept confidence with the same side that picked up that victory. And after just four minutes, Ryan Kent had the home fans out of their seats when he fired a shot goalwards from 20 yards. Smithies pushed the ball wide for a corner, but the danger was far from over. From the resultant set-piece, Conor Hourihane’s centre was knocked back across the face of goal by Marc Roberts, and Watkins was there to head beyond the QPR keeper and fire the hosts in front. The early goal gave an already-confident Barnsley side even greater belief in themselves, and the R’s had to work hard to contain them as they pressed for a second. Josh Scowen came within inches of doing precisely that from another set piece in the 15th minute, as his header flew just wide from ten yards. Having ridden the storm, QPR settled into the game and Luongo almost picked put Polter in the centre following good work down the left in the 24th minute, but the Tykes were able to clear the danger through Roberts. Cousins almost had a sight of goal on 33 minutes after Onuoha broke down the right, but the hosts were able to smother the danger just before the former Charlton man could get his shot away. Five minutes later, the R’s came within a whisker of levelling through a stunning Tjaronn Chery free-kick. After Ngbakoto was felled on the edge of the box, the Dutchman stepped up and curled his effort off the top of the crossbar, with goalkeeper Adam Davies beaten. Moments later, Henry pulled a shot wide from 20 yards while, on the stroke of half-time, Polter headed Cousins’ centre over. After the break, Rangers flew out of the blocks and won a penalty within a minute of the re-start, after Polter was brought down in the box after brilliantly getting goal-side of Roberts. 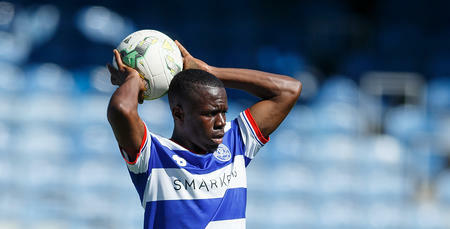 Chery stepped up to smash his third spot-kick in as many league games into the back of the net and draw the R’s level. 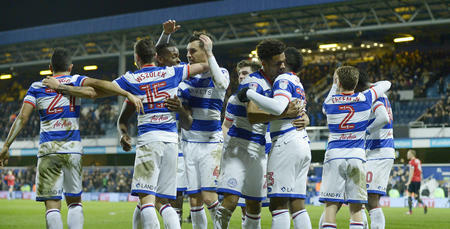 Cousins flashed a shot wide in the 49th minute as QPR looked to take control of proceedings in a toughly-fought encounter. Kent had a great chance to restore Barnsley’s lead in the 51st minute when the ball fell invitingly for him on the edge of the area, but he blazed over the bar. Moments later, Onuoha pulled off a great block to stop Adam Hammill’s goal-bound effort from flying into the back of the net. Kent then forced a fine save from Smithies, who dived low to his right to stop a fierce drive as the hosts went in search of their second. At the other end, Chery shot wide after neat play involving Polter and Ngbakoto. It was certainly end to end stuff at Oakwell, with both sides seemingly only interested in grabbing all three points. It made for a hugely entertaining affair. And on 74 minutes the R’s were awarded their second penalty of the evening when Ngbakoto was brought down in the box, with the former Metz man getting to the ball just before the challenge came in. This time it was the turn of Polter to put the ball on the spot and slam home to give the R’s the advantage. But QPR’s lead lasted only a matter of three minutes, with Hourihane curling home a fantastic free-kick from 20 yards, which gave Smithies no chance. With little under ten minutes remaining, Hasselbaink made his first change of the night, bringing on Nasser El Khayati for Ngbakoto. But after a frantic night of action, there was to be one final twist, and it went in favour of the hosts. The ball was clipped down Barnsley’s right side, and despite an apparent push on Hall, the referee allowed play to continue and Scowen was on hand to fire the ball into the roof of the net from close range to seal maximum points for the Tykes. In injury time, Hall was sent off for his second bookable offence.